The BIG Secret Revealed...You, Me, and The Magnificent Mile! We ONLY have 24 seats available!!! This idea has been living in a dreamy space in my head for 3 years...3 YEARS PEOPLE!!! Now, it is happening and it's better than I could ever have imagined. This trip is going to go above and beyond a typical Chicago shopping trip. My wonderful team and I have brainstormed EVERYTHING we could possibly think of to make this a fun, stress free, positive, and unforgettabe experience for all of the beautiful ladies that join us. Mark your calendar for an all day event on Thursday August 7, 2014!!! I chose a Thursday to avoid the weekend crowds and get you out of work for a day ;) You're welcome. The focus of this trip is to build YOUR essential items list for fall and help you successfully execute that list with ease on the Magnificent Mile (Michagan Ave.)! Long before we hop on that beautiful bus, we will be doing a lot of prep creating your customized shopping list. After signing up, I will email you a survey to fill out. From the survey we will determine your list of essential items for Fall. You will receive the list of your personal Fall items, along with a list of "Krystle Approved" stores where I suggest you go to find those items. Of course, my suggestions will include information on the cuts and styles that will best accentuate your body shape, budget, and personal style. For that extra tricky piece, you know...that one HUGELY annoying item that gives you trouble every time you go shopping for it...yeah...that's the one ;) You will have personalized help from me, my assistant stylist, and the staff at Nordstroms at your scheduled appointment to find that extra tricky piece. What?! Yes...you read correctly. I will be partnering with Nordstroms on Michigan Ave. on that wonderful day. In fact, that is where I will be housed all day pulling those specific pieces just for YOU! 5:00pm Ready to rock and roll at the special Love, Krystle Dinner! 7:00pm Hopping back on the love bus with all my loves! P.S. Notice your 30 minute scheduled time to meet with Krystle and her team at Nordstroms. There you will get personalized attention along side a few other ladies. Since we will have determined the item you would like help finding ahead of time, Krystle will have options pulled and ready for you to try upon arrival. Love Krystle map of Michigan Ave.
With Mother's day right around the corner, I was thinking this would be a really killer gift! And it WOULD...so I started thinking...wouldn't this be fun with a friend, mother, sister, favorite co-worker...etc.? So I have a special price when you sign up in two's :) You and your bestie (sistie, momsie, co-worksie...) will save a total of $100 together! With the limited 24 seats available, I encourage you to reserve your ticket(s) ASAP by selecting your ticket option below through Paypal. You can email me if you would prefer another form of payment. Note: We don't anticipate this being a problem, but there are a minimum number of seats we need to fill to give this trip the green light. So if there are others you would like on the trip, please forward this info to them! No refunds accepted. However, if we don't reach our minimum number for the trip, you will be re-embursed in full. In the Emerson Neighborhood located at 807 E. Johnson St. there is a premier designer boutique called Iona that offers beautiful cutting edge pieces unlike anything else in Madison. With styles ranging from modern and edgy to bohemian and classic, they truly carry something for everyone. Pamela (right), the owner of Iona, brings each season’s carefully edited collections as well as quality basics, both from established designers we know and love and emerging ones in which she truly believes. One of my guilty pleasures is learning from the fantastic staff (Shana, Gabrielle, and Stephanie) about the beauty behind the brands and the stories they have to tell. This gorgeous dress is a A.L.C (Andrea Lieberman Collection ) who was a celebrity stylist first before launching her line. The necklace is IOSSELLIANI a jewelry line out of Rome, Italy. Love this Grey Helmut Lang sonar wool asymmetrical zip sweater, with a Raquel Allegra tie dye tank top underneath, MOTHER denim, and necklace is K/LLER collection. Here is a hand dyed Raquel Allegra tie dye maxi dress with a IOSSELLIANI necklace. I could go on for days about this boutique, so I think I need to stop gushing. Many thanks to my beautiful client Michele for letting me play dress up, the lovely Iona staff, and Friou Photography for taking these lovely images! These are super reasonable in price (a little more than a latte). A great way to see if you want to commit to a nicer pair in the future. Look hot AND do some good! ONE for ONE baby! I <3 TOMS! Although this may not meet all of the work dress code requirements, I think this look is so freaking amazing! You could wear it to spring/summer parties, brunch, a wedding, on a date...dress it up with a blouse and heels, dress it down with flats and a tee, wear the pieces separately...Endless options. BIG FAN! You could also pair white shorts with a blazer. Super chic. These are NOT going anywhere anytime soon. This style is so flattering and classy looking. If you are worried about your legs looking shorter, go with a pair that keep the ankle open, like the pic on the right. These are perfect and I love that the heel isn't outrageous! This makes it easy for the occasional heel wearers (like me) to wear them without feeling the pain. These are a great color combo and are open at the ankle making your legs look longer. Some of you know that I was a professional makeup artist previously to styling. It was and sometimes still is another avenue I like to use to help women embrace their unique beauty. I treat makeup as another step to completing the "look". It can really add that extra oomph, just like an accessory. In fact, that's how I think a little pop of color on the lips should be treated, like another fabulous accessory. A fun bright spring lip looks fantastic on almost every skin tone. Especially if you tend to be on the fair side. And yes, you can rock this shade! I like to blot right after application to give it a more subdued appearance. The "Soft Shirt" is a camp style shirt that is made of silk or a silk/cotton blend. 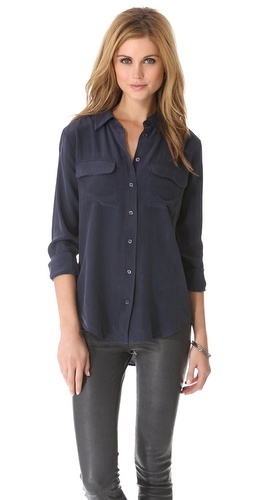 This makes it lightweight, blouse like, and super flattering. You can wear them with skirts, tie them up over a dress, or front tuck them with your denim pants or shorts...it is the perfect shirt for spring. This company is FANTASTIC! Transparent pricing on their items and the factories they use. LOVE them. I hope this gave you some guidance...and now that the weather is FINALLY cooperating, let's rock out spring by looking good and feeling even better! Woot woot!